Nepalese people’s revolution, which is now at the threshold of seizing central power, has drawn profound attention of people of the world, both oppressors and oppressed. On the one hand, the US imperialism, the number one enemy of the oppressed nations and people of the world, and other reactionaries all across the globe are doing all they ran, including disinformation campaign, to annihilate this. On the other, the proletariats and oppressed masses all over the world are striving hard to defend this revolution that has become a beacon of the world proletarian revolution in the beginning of the twenty-first century. 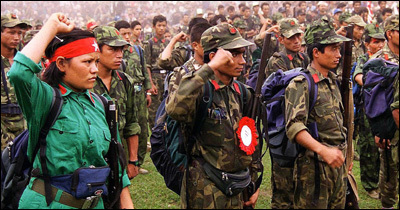 With respect to this situation, the Sixth Regional Conference, held in December 2006, of Maoist parties and organisations in South Asia, organised in RIM, decided to take up a campaign in the region. The campaign, organised in the form of a speaking tour, had mainly taken up three political goals. Firstly, it was to garner extensive support and strengthen solidarity in favour of Nepalese people’s revolution in the region, secondly, expose reactionary conspiracies to sabotage it and thirdly elucidate Party’s present tactic and clarify confusions arisen out of it. Starting from Trivandrum on February 1, 2007, the programs that were successfully organised in five other Capital cities of Indian States were in Chennai, Bangalore, Hyderabad, Kolkata and Chandigarh. Along with this, 11 other programs were organised in different cities all over India. Including other pro-people slogans, “Defend Nepalese people’s revolution” and “Spread revolution all over the world” were the main slogans of the programmes. All of the programmes were basically successful, although there were some shortcomings and limitations on the part of organisers. Porattam Kerala, Inquilabi Manch Punjab and Nepalese People’s Right Protection Committee India had taken up initiative to launch this programme. Various pro-people parties, including CPI (ML) (Liberation), CPI (ML) (New Democracy) etc. helped succeed this programme very much enthusiastically. Comrade M N Ravunni, convenor of Porattam Kerala, Comrade Laxman Pant, the ex-convenor of Nepalese People’s Right Protection Committee India, Comrade Suresh Ale Magar and Comrade Padma Lai Vishwakarma, the members of interim legislature representing CPN (Maoist) and Comrade S Sarkar from Bangladesh were the main speakers among others. Comrade M N Ravunni was present in all of the programs organised in India. It was not in India alone but same kinds of programmes were organised in Pakistan also. Mazdoor Kisan Party, with the help of other pro-people organisations in Pakistan, took up initiative to organise Programs in Peshawar and Lahore, in February. ‘US imperialism and Indian expansionism hands off Nepal’ was another slogan that they highlighted in addition to aforesaid two slogans. sabotage the revolution in Nepal, the just-loving people from India and Pakistan have conferred a good sense of proletarian internationalism by showing solidarity towards Nepalese oppressed masses and the revolution they are waging under the adept leadership of party, the Communist party of Nepal (Maoist). The success of these programmes has on the one hand inspired the oppressed masses in those countries and on the other the Nepalese oppressed masses have been encouraged further in their resolve of accomplishing New Democratic Revolution in Nepal.